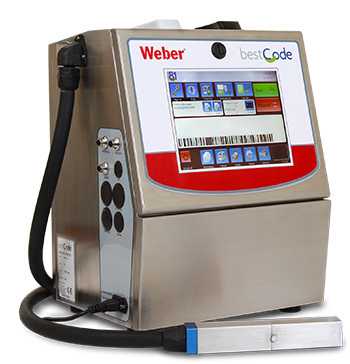 BestCode Industrial Marking and Coding Systems print best-by, lot code, sell-by, expiration codes and other identifying marks and codes on industrial and consumer goods to ensure product traceability. And the Next Series 8 is a complete range of small character printing systems that print high-speed, reliable marks and codes on a wide range of substrates including plastic, glass, paper and more. The new entry-level economically-priced Model 81 system makes it extremely affordable for start-up companies to begin date-coding their products.. Designed for entry-level applications, targeted at applications printing 1 or 2 lines of text, with 1 shift per day, 5 days per week – 2000 hour annual operation, with slower production line speeds. Designed for basic applications, targeted at applications printing 1 or 2 lines of text, with 1-2 shifts per day, 5 days per week – 2000-4000 hour annual operation, with modest production line speeds. Designed for high speed applications, targeted at applications printing 1-3 lines of text with 1-2 shifts per day, 5 days per week – 2000-4000 hour annual operation, with high speed production line speeds. Designed for high speed / high use applications, targeted at applications printing 1-4 lines of text, with 2-3 shifts per day, 5-7 days per week 6000-8000 hour annual operation, with high speed production line speeds. Series 8 printheads start clean every time. 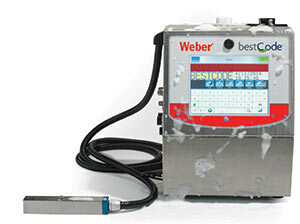 Advanced CleanStart™ extends operation times by automatically cleaning printhead - eliminating daily and weekly cleanings typical in coding machinery. You can spend more than 500 operation hours between human interactions. BestCode’s AutoOff™ Go Home Button is used at the end of the workday. Pressing the AutoOff™ Go Home Button automates the time consuming end of day manual routines by automatically cleaning the printhead and powering the system off. Press the button and go home – no wait time or manual cleaning to go through. These printheads are industrial stainless steel and built-to-last for the harshest printing applications. Designed for a clean, pin-pointed start every time, the BestCode printheads are built around our proprietary micro-disk drop generator. A single small bore tube delivers ink and solvent eliminating the need for multiple inlets/outlets. 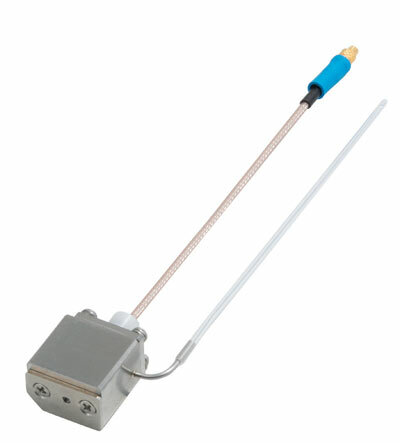 An integrated valve provides Direct Solvent Injection for printhead nozzle and gutter cleaning. Jet Startup is ready to print in less than 1 minute. Series 8 systems print fast, faster and fastest – 3 speed settings. A range of quick to immediate dry inks have been developed for use with Series 8 printing systems. Inks available include MEK, Acetone, Ethanol, and Acetone/Ethanol blend based inks. Multiple colors are available as are a number of specialty fluids for unique applications. Print non-contact, immediate dry, permanent, high-speed, reliable marks and codes on a wide range of substrates, including plastic, glass, paper and more. 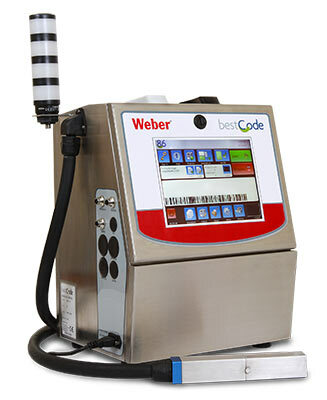 BestCode’s true non-contact printing allows ink throw distances at a minimum .5” (12mm) and up to 2” (50mm). Print marks and codes as small as .025" (.6 mm) – print on the edge of a toothpick or paperclip, and as large as .75" (19 mm) – print on the side of corrugated cases and other large character applications. 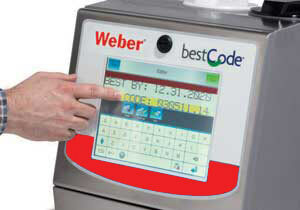 BestCode products are designed for the global market. Systems use multi-national character sets, featuring multiple languages and Unicode character printing – over 60,000 characters. Print everything. Waste nothing! Bottles drain completely so you can print every drop. 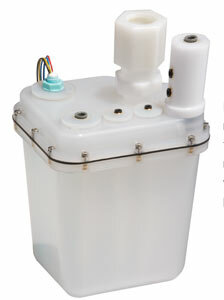 External fill fluid addition allows on-the-fly Ink and Solvent filling without opening enclosure. The large, clean, mistake proof intelligent one quart fluid containers are sized differently eliminating the risk of adding Solvent or Ink into the wrong tank, while extending time between fluid additions. The quart ink and solvent bottles know their fluid type, and shelf life. Large Volume™ ink and solvent tanks. High volume, demanding print applications are achieved with minimal user intervention. Tanks hold multiple liters of fluids for extended run time. Ink tank volumes can operate multiple months between additions. Solvent tank volumes can operate 1000+ operational hours between additions. The Series 8 systems are designed for industrial extreme applications, engineered to the operating specification edges. Systems operate in wet/dry/dusty and hot/cold applications. Industrial, all metal, stainless steel enclosure. The systems are “Built-to-Last” in a compact, lightweight space saving design. Operate in the most extreme wet and dry applications with an IP55, or IP65 rated enclosure for high dust. Using automatic detection systems, variable fan speed and highly efficient air flow, TempSense™ ensures the system operates in the correct temperature range. High volume air filters operate 12 months between service intervals. 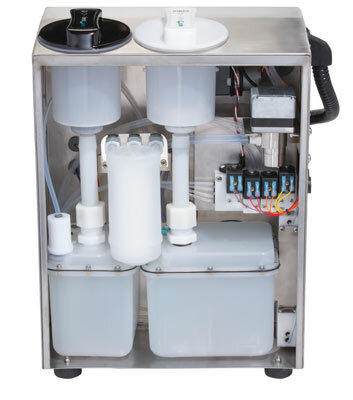 EcoTec™ fluid management system reduces solvent consumption, lowering overall cost of ownership while extending the time between solvent additions and filter replacements. 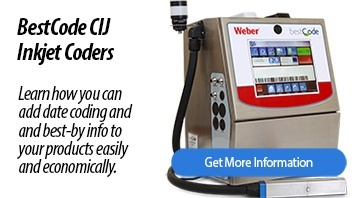 EcoTec™ is a proprietary ink tank, reduced cycle pump, SmartFilter™ and a twin trap vapor condensing unit purpose designed for CIJ Technology. The ink tank is designed to last the life of the system. The reduced cycle pump extends pump life and lowers fluid operating temperature resulting in lower evaporation rates. Vapor condensing and reduced solvent evaporation lowers overall ownership cost and reduces interaction time adding solvent to the system. Filters know their install date, keeping track of usage and alerting when the ink filter should be replaced. Quick change, extended life filters operate up to 8,000 hours – 12 months. Systems feature high speed, state-of-the-art 208Mhz processor core integrated into a single electronic board. Systems feature large memory storage, allowing multiple thousand messages to be stored for selection. Integrated USB, RS232, multiple programmable inputs and outputs and optional Ethernet communications enable network connectivity allowing integration into any application Use USB memory sticks to backup, restore, move, and carry system files wherever you go.